I think it’s safe to say that I am a little obsessed with makeup. I created this tag to show my makeup addict pride! I love makeup and I’m not afraid to show it! Today I came up with 10 questions for this tag. 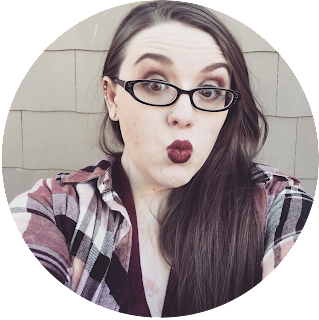 So let’s talk favorite brands, product obsessions, and more. As always there will be a copy of the questions in the comments. 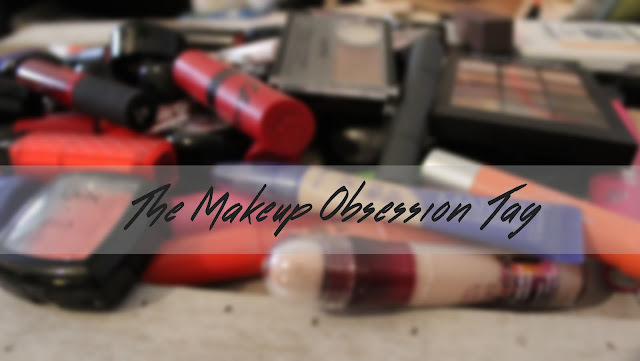 Feel free to do this tag and share your makeup obsessions! 1.) 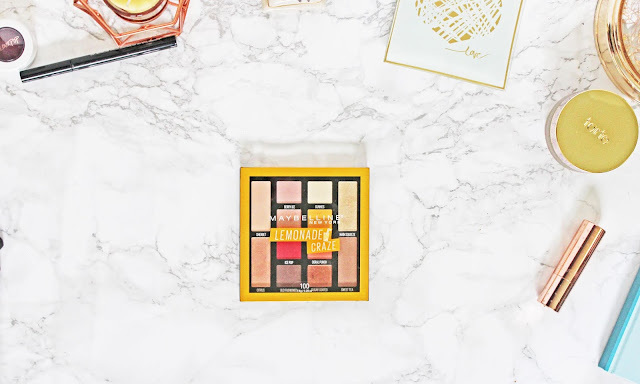 What is your favorite drugstore makeup brand? 2.) What is your favorite high-end brand? This one is a little harder. I love so main different things from different brands. I’m going to have to say Urban Decay. I love their all lippies and eyeliners. Though the more I try of MAC the more I love it. So MAC might pass up UD soon. 3.) What is your favorite brand of brushes? Easy Real Techniques. Though Eco Tools brushes run a close second. I love them both so much they are both 100% synthetic and recycled. The handles of Eco Tools are actually bamboo. I love both brands so much but when having to pick I have to say RT wins. They are a little softer and they are weighted a little better. But I still love both brands and have a ton of brushes from both. 4.) What is your favorite nail polish brand? Easiest question ever! My favorite nail polish brand is Sally Hansen! It’s such a great brand! Their polishes have such a great wear time! And they have great color selection! Almost every nail polish I own is from SH. I’m starting to try Essie and some makeup brands' polishes but SH will always be my favorite. It will always be the one I compare other polishes too. Lippies!!!!! 1000% lippies! I think you could probably see that one coming from my other lippie posts. I just really love lippies! I’m addicted and I love it! 6.) What is your biggest makeup obsession/addiction? Lippies! I can be a little reluctant to try new products from brands I don’t really know but I’ll try any lippie. I can’t stop buying them! 7.) How many products do you have of your addiction? 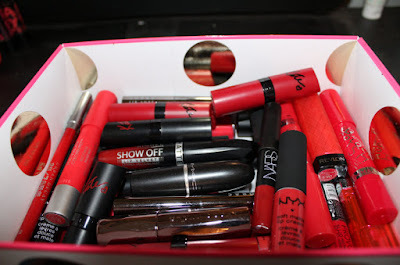 35 lip products. Honestly less than I thought. I guess I can buy more now! Haha. I have a problem… And I don’t want to get rid of it. 8.) What is your favorite thing to apply? It’s a little weird but I love to apply face powder. I always do an all over powder and I just love swirling around my fluffy brush. I just the motion. That's so weird! 9.) What products can you never leave the house without applying? I have to apply concealer over my spots and under my eyes, that’s why color match concealer is a really important thing to have in your makeup on-the-go bag. And I also have to apply NYX eyebrow cake powder. My eyebrows are so sparse toward my nose that I have to fill my brows or half of them won’t exist. I also love to do lippies to but sometimes a lippie with just brows and concealer doesn’t look right. I NEED an all matte electrics palette! I know UD has an electrics palette but out of the 10 shades only 4 are mattes and only 1 of them is a pure matte. I want a pure matte palette of brights! No shimmer, no glitter, no tonal pearl, no metallics, no shifts. Just pure matte bright color. That was fun! I know I’ve been doing a lot of tags lately. There are some I have wanted to do for a long time and others that I came up that I just really wanted to do. I’m almost done with the tags I want to do and then that will be it for awhile. I’m working on some really cool ideas for the next few months and I hoping to do some really cool stuff for Christmas. In the comments below let me know what your favorite brands are! Also let me know what product your want makeup companies to make. If you do this tag I'd love to read it! Leave a link in the comments below so I can find them! Or tweet them to me @ZombieGoddessxi with the hashtag #MakeupObsessionTAG. Leave a like if you enjoyed and if you have any questions or concerns feel free to message me. Much Love! Disclaimer: This post is not sponsored. I was not paid to talk about any of the brands mentioned it this post. I genuinely love these brands. Any and all opinions are my own. 1.) What is your favorite drugstore brand?